Creeper is one of the most recognizable mobs in Minecraft, his explosion frightens everyone. What if you can turn into him, but with some limitations and it will be visible even in multiplayer? 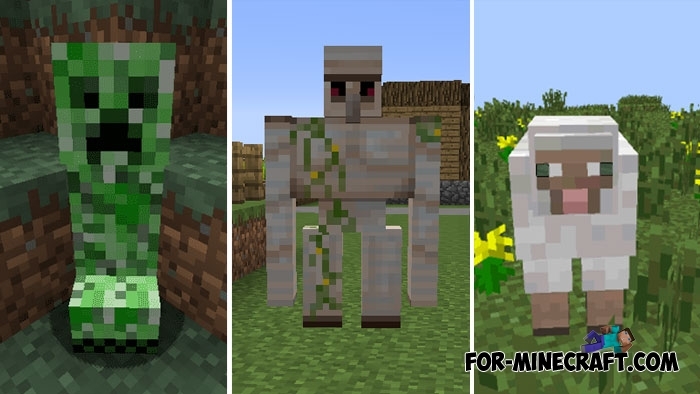 This at a glance simple skin pack adds almost all vanilla mobs to your collection of skins. Honestly, you could have found skins of mobs before, but they were redrawn and adapted to the size of your character. That is, many parameters such as the growth and shape of the body were completely different from the original. This skin pack completely transforms you into the desired mob, but only without abilities. In any case, every skin from this pack is compatible with servers, which means it is possible to disguise itself as any creature. Attention, skin pack supports only Minecraft PE 1.2.5, obsolete versions will not work. How to install the Turn into Mobs pack? Mods Collection (28 mods!) for Minecraft PEWe collected a lot of cool and very popular mods in this article, you only need to download one pack.